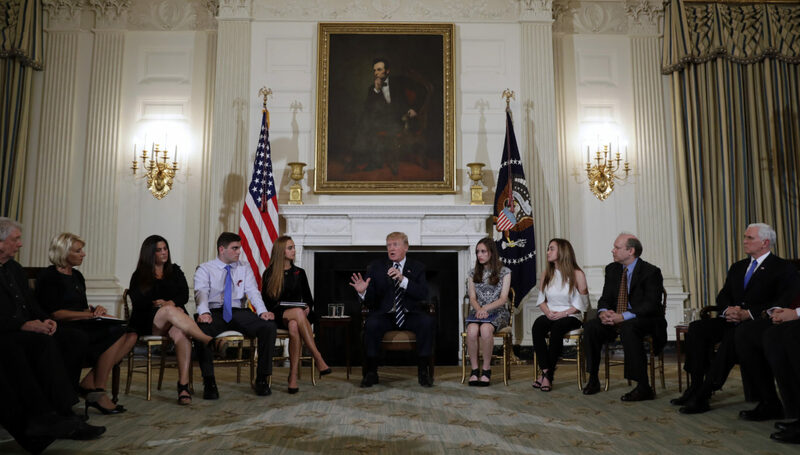 US President Donald Trump and Vice President Mike Pence met with survivors and families of those killed and injured in school shootings on Wednesday afternoon, following a shooting in Florida which killed 17 people. 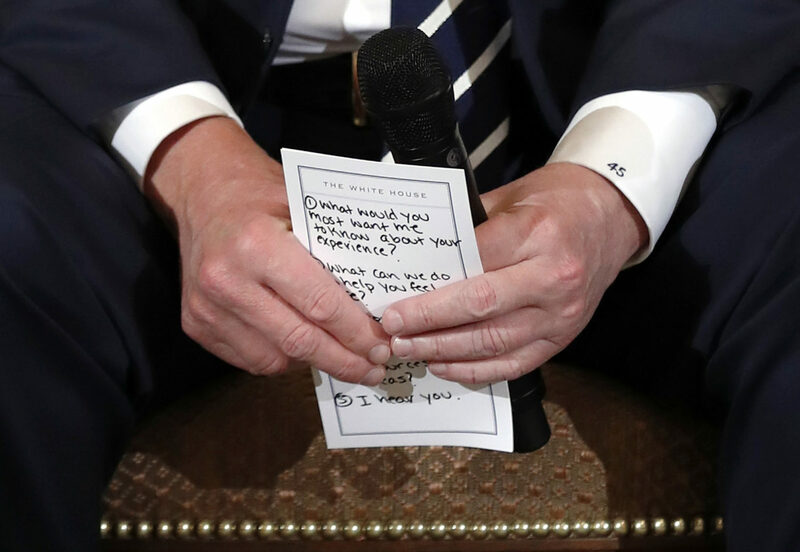 During the meeting, Trump’s notes were snapped by photographers. “1. What would you most want me to know about your experience? During the discussion held in the White House state dining room and broadcast live to Americans, the mother of a six-year-old who was killed in the 2012 Sandy Hook shooting implored Trump not to let the moment pass by for action. “This is not difficult. These deaths are preventable,” Nicole Hockley said. Survivors of the most recent shooting in Florida also spoke at the meeting. Samuel Zeif, whose tweets to his brother went viral after the attack, asked Trump why the sale of semi-automatic weapons like the AR15 used to attack his fellow pupils were not more tightly controlled. He also referenced Australia’s move to control gun ownership after its own school shooting in 1996. 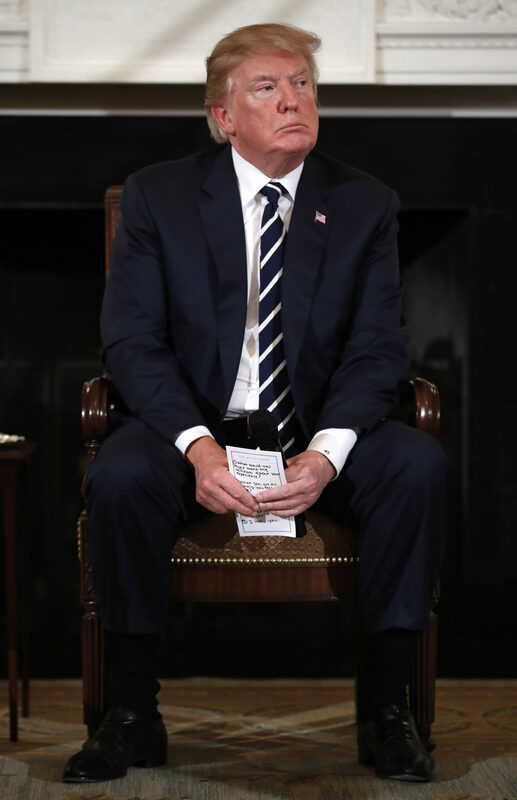 Trump struck a conciliatory tone in the listening session, which lasted for more than an hour. However, he asked those gathered in the room how they felt about the proposal to arm teachers or other school staff and suggested sending veterans into schools with guns, saying that could “solve your problem”. The 45th president asked for ideas to prevent attacks in future. One young woman from the Marjory Stoneman Douglas school in Florida suggested better training for teachers and students across at states in the country. Another student from the school praised Trump’s leadership and called for better dialogue between the opposing sides of the debate. At the end of the meeting, Trump told the attendees he “grieved” for them, and thanked them for their ideas. He said his government would look strongly into age-restrictions on weapons and better mental health support. Brexit Bus: Is 2,000 million a real number or should it be 2 billion?